The Denza EV is Daimler and BYD's sole joint-venture model. Daimler and BYD Co. will each invest 500 million yuan ($72.6 million) to shore up their debt-laden electric vehicle joint venture in China. Shenzhen Denza New Energy Automotive Co. will increase its capitalization to 3.36 billion yuan, up from 2.36 billion yuan. 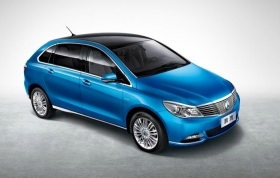 According to BYD, the money will help Denza expand its distribution network and improve brand recognition. Denza, a 50-50 partnership between BYD and Daimler, has been unprofitable since 2014, when its sole EV model hit the market. The Denza EV, a five-seat compact sedan, is powered by BYD's lithium ion phosphate batteries and has a range of 300 km (186 miles) on a single charge. It has a starting price of 369,000 yuan. With government subsidies, it still sells for more than 300,000 yuan. Because of high prices and weak brand recognition, sales of the Denza EV fell 21 percent to 2,287 vehicles last year. As sales stagnated, Denza lost 72.5 million yuan in the first three months of this year, following a loss of 1.3 billion yuan in 2016. BYD did not disclose sales of the Denza EV for the first quarter. Denza is incorporated in the south China city of Shenzhen where BYD is headquartered. BYD is China's top producer of electric vehicles.